The Station today is at St. Paul without-the-walls. On this day the catechumens were subjected to a new examination and, if approved, were registered for Baptism. The beginning of the four Gospels was read to them, and the Creed and the Our Father was “given,” or explained to them. Today’s Mass has a decided Baptismal character. The joys of this day were anticipated on Laetare Sunday. The Patriarchal Basilica of Saint Paul Outside the Walls is the largest church in Rome after Saint Peter’s Basilica and is sometimes referred to as the “Ostian Basilica” because of its location along the Ostian Way. The Apostle Paul was brought to Rome as a prisoner and martyred between the years 64 and 67 during the persecution of Nero. Aquae Salviae, today’s Tre Fontana, about two miles from the basilica, is the traditional site of Paul’s martyrdom. Since he was a Roman citizen, his execution was probably by beheading rather than public torture. The body was claimed by the Roman matron Lucina, who buried it in her family tomb near a vineyard on the road to Ostia. An oratory was soon erected over it. In 324 Constantine replaced the oratory with a basilica and placed the apostle’s body in a bronze sarcophagus with a marble slab over it. Pope Sylvester I (314-355) is said to have consecrated the church on the same day on which the Basilica of St. Peter was consecrated – on November 18, 326. Because of the large number of pilgrims, a new building was soon needed, and in 386 Valentinian II made plans for a larger building, which Theodosius began and Honorius completed. Pope Leo III (795-816) further embellished it, and in time this became the largest and most beautiful church in Rome, surpassing even St. Peter’s. After the Saracens pillaged (847) the basilica, John VIII (872-882) built a village around it and fortified it. The village was called Johannipolis (Giovannipoli) or “City of John” and it successfully defended the basilica from the heavy attacks of Emperor Henry IV in the 11th century. Thus the basilica stood until the fateful night of July 15, 1823, when the roof caught fire and crashed into the nave and aisles, destroying most of the basilica. At the time of the fire, Pius VII was dying, and those attending him thought it better to keep the sad news from him; he died on July 20, 1823. Leo XII (1823-1829) ordered the basilica’s restoration, financed through donations from around the world. The transept was consecrated by Gregory XVI (1831-1846) on October 5, 1840, and completed in 1854. On December 10 of that year it was consecrated by Blessed Pius IX (1846-1878). The present basilica is virtually the same in size and plan as the one that had been destroyed, and in fact is an excellent (perhaps the best) representation of an early Christian basilica because it is devoid of the natural accretions and decorations that collect over many centuries of use. In 1891 a nearby explosion broke most of the stained glass windows, which were then replaced with Egyptian alabaster. The gold mosaics on the façade depict Christ between the Apostles Peter and Paul. Below is the Lamb of God on the mountain of Paradise. The four rivers symbolize the Gospels, and the twelve lambs drinking from the rivers symbolize the Apostles. The cities are Jerusalem and Bethlehem. The lower section shows the Old Testament Prophets Isaiah, Jeremiah, Ezekiel, and Daniel. The reliefs on the main door show scenes from the lives of Peter and Paul in Rome. The basilica has the “T” shape of an Egyptian cross, with one nave and double aisles separated by eighty columns of Montofarno granite. Between the windows, the walls of the nave have twenty-two 19th century frescoes by various artists illustrating episodes from St. Paul’s life. 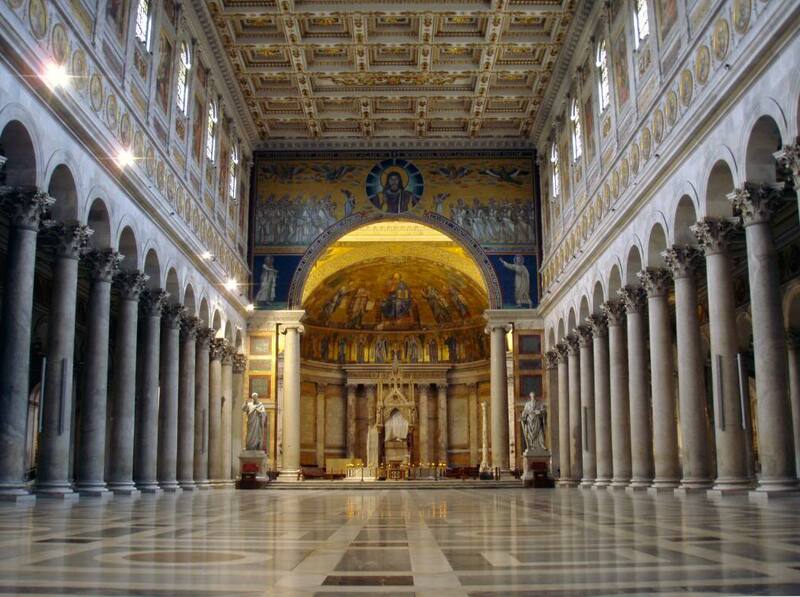 Beneath the frescoes and windows are friezes of mosaic portraits of the popes. The portrait of Pope John Paul II is on the right aisle, near the right transept, and has a light shining on it. There seems to be room for only eight more portraits, a portentious fact for those with an apocalyptic bent! The ten niches of the outer walls have statues of the apostles, and the coffered ceiling is in beautiful Renaissance style, with much gold stucco work. Under the main altar is the Apostle’s tomb. Excavations at the time of the rebuilding uncovered a first-century tomb, surrounded by Christian and pagan burials. A marble slab (approximately 7 feet by 3 feet 6 inches) with the inscription Paulo Apostolomart is above the bronze sarcophagus containing the Apostle’s relics. Above St. Paul’s tomb is the celebrated Gothic baldachin of Arnolfo di Cambio (1245-1310). The four corner niches have statues of Sts. Peter, Paul, and Timothy, as well as Bartholomew, the Benedictine abbot of the basilica who commissioned it. By the confessio are four alabaster columns that support nothing but air. They were given to the church by the Khedive of Egypt in 1840, and formed part of a larger baldachino that covered this area – it even covered the canopy above the high altar. It was taken down after a short time, but the columns remain. The apse mosaic dates from about 1220 and survived the fire of 1823. It is the work of Venetian artists sent to Rome to replace a much damaged fifth-century mosaic. A majestic Teaching Christ, wearing imperial colors, sits erect on a cushioned throne; his visage is serene and in his left hand he holds a book with the words, “Come blessed of my Father and receive the kingdom prepared for you.” His right hand is raised in blessing in the Greek manner. Saints Paul and Luke are on his right, with Saints Peter and Andrew on his left. Honorius, who commissioned the work, is the tiny figure kneeling at Christ’s right foot. In the center, lower down, is a jeweled cross on a throne with symbols of the Passion, flanked by two angels with the other nine apostles, as well as Saints Matthias, Barnabas, and Mark. The figures are separated from each other by trees; they sing the Gloria from the Mass, the words of which are written on the scrolls they hold. The superbly carved Easter candlestick is approximately eighteen feet tall and dates from about 1170. It has figures of animals and scenes from Christ’s passion and the Ascension on it. Also notice the Chapel of St. Stephen, a reminder that before his conversion, Saul took part in the stoning of St. Stephen, protomartyr of the church, who is buried at St. Lawrence Outside the Walls. Left of the apse is the Blessed Sacrament Chapel, with a 14th century crucifix that is said to have spoken, or nodded, to St. Bridget of Sweden when she prayed here in 1370. Also in this chapel is the 12th century icon of the Blessed Virgin before which St. Ignatius of Loyola and his companions made their first public vows on August 22, 1541. The cloister is a touch of the Middle Ages, and though smaller than that of St. John Lateran, nevertheless it is more ornate, better preserved, and more beautiful. It is thought to be the work of Pietro Vassalletto (Rome 1154-1186), who also worked on the large Easter candlestick in the basilica. While at the basilica, visit the Chapel of the Relics which houses the chains which once bound the Apostle Paul while a prisoner in Rome. This basilica was the traditional site of the First Scrutiny of the Catechumenate. This is the reason why a major basilica was erected by Gregory the Great as a station church in mid-week. The tomb of the Apostles, called so specially by Christ, reminds one of the Lenten theme of conversion. Traditionally the Title of this basilica was bestowed upon the reigning King of England with the designation “Proto-Canon.” Regrettably, this Title is now vacant. The basilica is cared for by Benedictine monks.